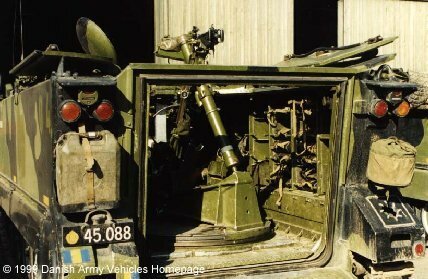 56 vehicles implemented in the Danish Army, some being the M106 delivered in 1964 and some the M125A1 (shown) delivered in the mid 1970´s. The 81 mm mortar is placed in mount M/65. 120 rounds are carried in sidemounted racks. Approx max. range 3,6 km. Armed with a 12.7 mm (cal .50) machine gun.